Kobe Bryant Discussion: Perfect Ending! Discussion in 'Lakers Discussion' started by DjBelvedere, Oct 5, 2014. Haven't seen this here so far. So I start this thread. Think we gonna do this again for every player right? Kind of to keep things more organized I guess. I hope that is ok. I am really excited to see Kobe finally play again tomorrow night. And it's just a preseason game . How about you guys? As I was organizing some Links that I got saved up from the past I came along this from 2008. After what I saw in this training camp so far I am still amazed at how Kobe has been doing this for so long. Kind of old but still a good read. Kobe Bryant's incredible agility, strength, and stamina on the court aren't simply some miraculous, God-given ability. Kobe works hard, year-round, to be one of the fittest players in the NBA. In an interview with "Men's Fitness Magazine," Kobe talked about how hard he pushes himself: "You're going to have to feel some pain, you're going to have to feel like your lungs are burning, and you know, you want to spit up blood, that sort of thing." So, are you ready to work out like a pro? Or are you simply curious about what Kobe goes through to earn his annual salary of $19.5 million? Either way, here are some details of Kobe Bryant's monster off-season workout plan. Six days per week, Kobe Bryant does six hour workouts. Each workout consists of 2 hours of running, 2 hours of basketball, 1 hour of cardio-vascular exercise, and 1 hour of weight lifting. Kobe varies his running, sometimes doing sprints or distance on the track or cross-country field course, and sometimes running on the basketball court. For court running, he does an incredible two hours of sprints and suicides (sometimes called "gut busters"). Suicide drills build explosive strength and quick starts. A player begins at one baseline, runs and touches the foul line, then back to touch the baseline, then to half court, back, to the opposite foul line, back, and to the opposite baseline and back. Ideally, the player runs at a quick but steady pace throughout the exercise. It's important to be able to run swiftly and tirelessly, but it won't do much good if you can't sink a shot. So, Kobe shoots between 700 and 1,000 baskets per day. While shooting, he fine-tunes his form and technique, running over each type of shot from different court positions, until he achieves perfect muscle-memory. As if all that running weren't enough, Kobe Bryant also does an hour per day of cardio-vascular exercise, such as jumping rope, boxing, or other high-intensity work-outs. This keeps his heart and lungs at peak performance, and improves his stamina. Days 1 and 4: Bench press, lateral pull-downs, incline press, military press, and abdominal crunches. Days 2 and 5: Lateral dumbbell raises, bar dips, triceps press-downs, bicep curls, and abdominal crunches. Days 3 and 6: Back and front squats, leg curls, leg extensions, calf raises, and abdominal crunches. Note that Kobe himself says that he also does clean-pulls, snatches, and Romanian dead-lifts. In any case, he spends four days per week on upper-body strength, two days on legs, and he also does crunches each day for core strength. This is Kobe Bryant's off-season workout schedule. During the NBA season, he has to be careful not to overwork, so he dials it back... to a mere 4 hours per day on top of team practices and games! "Kobe Bryant: He trains harder and longer than anyone else in the NBA," interview with Brandon Guarneri, Men's Fitness Magazine, http://www.mensfitness.com/exclusives/206. "Kobe Bryant's Workout Schedule," hotsizzle on Inside Hoops Forum Message Board, http://www.insidehoops.com/forum/showthread.php?t=9305. Yeah, we need one of these for each player, for each season. Yeah im excited as well. I have tempered expectations but I think Kobe will be the same Kobe we all know and love (and hate at times for some people), just with his athleticism toned down a notch. Scott likes Kobe operating below the FT line extended, where he’s been dominating practice. Can run O through him from there. I think we'll see Kobe in the post a lot more and that's great news. JLaker17 and BigDan24 like this. Yes. Scott is also going to use him playing more SF; less facilitating at the PG position while Nash, Lin, initiate the offense. He'll be able to play more off ball, play off curls/screens, operate from the mid-post, high-post, etc...good move by Scott. Definitely. Just in those practices you're seeing Kobe curling more to the free throw line and that's exactly where we need him. I'm looking forward to him curling and then finding one of the bigs at the rim too. I think the offense is going to look great with Kobe out there. I hope by playing more below the free throw line, he indirectly gets more foul calls and trips to the line. He can easily avg. 25 pts. a game if he went to the line 7-8 times a game. 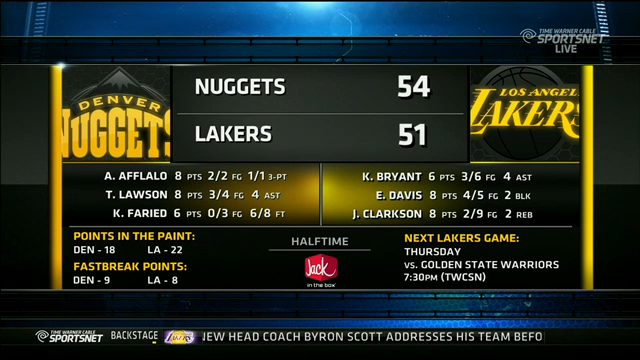 Kobe in the post is great news for his FG%, but I do worry a bit about how much he's going to get banged. I'm sure the legs and knees are fine, but I am just going to cringe every time someone runs into him or leans on him. keptic, Chillbongo and trodgers like this. I wanna see how he attacks the basket today and how his lift is. That he's gonna dominate in the post is a given for me. Really anxious to see how he looks out there today, since all the practice reports and such have been speaking so highly. As much as I missed Kobe last year, taking time to fully strenghthen that achilles, plus the rest his knees received...I think it will allow us to see a very good Kobe. He will soon put to rest this "non top 30 player in the league" talk. 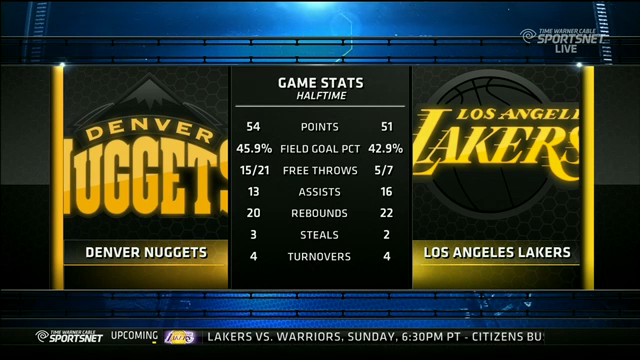 I included the halftime report graphic with the log from tonight. trodgers and keptic like this. I just hope he can stay healthy and be 75% of what he was the year he went out initially. Perhaps that notion is far fetched itself. But I think if anyone can do it, it's Kobe. I really liked what I heard from Gary Vitti about focusing on being smart, and controlling the level of exhaustion that Kobe's body will endure. Makes me mad to think about how hard he was pushing himself/being pushed during the D'Antoni era. Heres to an eighth seed. I can dream right? Kobe in the playoffs.. He looked better than I thought he would tonight. Just hope he stays healthy ! When the time is right and there is an opening (may save it for regular season) Kobe is going to blast through to the hoop, rise up and jam it really good. And we're all going to go nuts. He stuffed once or twice last year in not nearly as good shape as he's in now. It will be a team picker upper in a key spot as well. That's what he does. Looked damn good to me tonight against Denver. The fakes and moves and pumps seem very fast already.